Humidifiers can ease problems caused by dry air. But they need regular maintenance. Here are tips to ensure your humidifier doesn’t become a household health hazard. Dry sinuses, bloody noses and cracked lips — humidifiers can help soothe these familiar problems caused by dry indoor air. Humidifiers can also help ease symptoms of a cold or another respiratory condition. But be cautious: Although useful, humidifiers can actually make you sick if they aren’t maintained properly or if humidity levels stay too high. If you use humidifiers, be sure to monitor humidity levels and keep your humidifier clean. Dirty humidifiers can breed mold or bacteria. If you have allergies or asthma, talk to your doctor before using a humidifier. Central humidifiers are built into home heating and air conditioning systems and are designed to humidify the whole house. Ultrasonic humidifiers produce a cool mist with ultrasonic vibration. Impeller humidifiers produce a cool mist with a rotating disk. Evaporators use a fan to blow air through a wet wick, filter or belt. Steam vaporizers use electricity to create steam that cools before leaving the machine. Avoid this type of humidifier if you have children; hot water inside this type of humidifier may cause burns if spilled. Humidity is the amount of water vapor in the air. The amount of humidity varies depending on the season, weather and where you live. Generally, humidity levels are higher in the summer and lower during winter months. Ideally, humidity in your home should be between 30 and 50 percent. Humidity that’s too low or too high can cause problems. Low humidity can cause dry skin, irritate your nasal passages and throat, and make your eyes itchy. High humidity can make your home feel stuffy and can cause condensation on walls, floors and other surfaces that triggers the growth of harmful bacteria, dust mites and molds. These allergens can cause respiratory problems and trigger allergy and asthma flare-ups. The best way to test humidity levels in your house is with a hygrometer. This device, which looks like a thermometer, measures the amount of moisture in the air. Hygrometers can be purchased at hardware stores and department stores. When buying a humidifier, consider purchasing one with a built-in hygrometer (humidistat) that maintains humidity within a healthy range. If you or your child has asthma or allergies, talk to your doctor before using a humidifier. Increased humidity may ease breathing in children and adults who have asthma or allergies, especially during a respiratory infection such as a cold. But dirty mist or increased growth of allergens caused by high humidity can trigger or worsen asthma and allergy symptoms. Use an air conditioner. Central or window-mounted air conditioning units dry the air, keeping indoor humidity at a comfortable and healthy level. Use a dehumidifier. These devices collect excess moisture from the air, lowering humidity levels. Dehumidifiers work like air conditioners, without the “cooling” effect. They’re often used to help dry out damp basements. Dirty reservoirs and filters in humidifiers can quickly breed bacteria and mold. Dirty humidifiers can be especially problematic for people with asthma and allergies, but even in healthy people humidifiers have the potential to trigger flu-like symptoms or even lung infections when the contaminated mist or steam is released into the air. Steam vaporizers or evaporators may be less likely to release airborne allergens than may cool-mist humidifiers. Use distilled or demineralized water. Tap water contains minerals that can create deposits inside your humidifier that promote bacterial growth. And, when released into the air, these minerals often appear as white dust on your furniture. You may also breathe in some minerals that are dispersed into the air. Distilled or demineralized water has a much lower mineral content compared with tap water. In addition, use demineralization cartridges or filters if recommended by the manufacturer. Change humidifier water often. Don’t allow film or deposits to develop inside your humidifiers. Empty the tanks, dry the inside surfaces and refill with clean water every day if possible, especially if using cool mist or ultrasonic humidifiers. Unplug the unit first. Clean humidifiers every three days. Unplug the humidifier before you clean it. Remove any mineral deposits or film from the tank or other parts of the humidifier with a 3 percent hydrogen peroxide solution, which is available at pharmacies. Some manufacturers recommend using chlorine bleach or other disinfectants. Always rinse the tank after cleaning to keep harmful chemicals from becoming airborne — and then inhaled. Change humidifier filters regularly. If the humidifier has a filter, change it at least as often as the manufacturer recommends — and more often if it’s dirty. Also regularly change the filter in your central air conditioning and heating system. Keep the area around humidifiers dry. If the area around a humidifier becomes damp or wet — including windows, carpeting, drapes or tablecloths — turn the humidifier down or reduce how frequently you use it. Prepare humidifiers for storage. Drain and clean humidifiers before storing them. And then clean them again when you take them out of storage for use. Throw away all used cartridges, cassettes or filters. Follow instructions for central humidifiers. If you have a humidifier built into your central heating and cooling system, read the instruction manual or ask your heating and cooling specialist about proper maintenance. Consider replacing old humidifiers. Over time, humidifiers can build up deposits that are difficult or impossible to remove and encourage growth of bacteria. The most common image of 3-D glasses is the iconic white cardboard frame with one blue lens and one red lens. These so-called anaglyph glasses have been widely used for well over half a century and have become the symbol of 3-D.
Anaglyph glasses are a “passive” form of 3-D, meaning they just filter out certain things naturally. One image is projected on a screen with a blue tint, and the other is projected in red. The blue lens only lets the red image through, and the red lens only lets the blue image through, so each eye sees a slightly different image. It doesn’t have to be red and blue; there are many color combinations that work, but red/blue and red/green are most common. “Although [anaglyph] can create a good depth sensation, it very seriously compromises the quality of the perceived color,” said Dr. Jim Sheedy of the Pacific University College of Optometry. Those color problems are one of the main reasons that anaglyph 3-D content has been declining in recent years. The main benefit of anaglyph glasses over other technologies is their price. Anaglyph glasses are so cheap that they are usually just given away. The next type of passive 3-D glasses is polarized, and works similarly to anaglyph. Instead of using colored lenses, the lenses are polarized, meaning they only let certain wavelengths of light through. This gives them a tinted look that can make them easy to mistake for regular sunglasses at first glance. When light is polarized, the light waves all oscillate in one direction. By displaying one image that is polarized “up and down,” another image that is polarized “left and right” and having each lens only let one of the two types of light through, these glasses can achieve a 3-D effect. “This can be very effective and does not have the color problems associated with anaglyph,” Sheedy said. For this reason, polarized 3-D glasses are the technology of choice for most 3-D content in movie theaters. In addition, the glasses themselves are relatively cheap to make, too. While it’s common to have simple plastic frames, theaters can even mount the polarized lenses in cardboard frames just like anaglyph glasses. Nicer polarized glasses can run anywhere from just a few dollars to $20. The most recent type of 3-D glasses, called shutter glasses, is also controversial for being the most expensive. Really expensive, in fact. Most TV manufacturers are selling shutter glasses for 3-D TVs at over $100 each. Shutter glasses take more of a brute force-approach to create 3-D content. Instead of having two slightly different images displayed simultaneously and filtering one to each eye, like passive glasses do, shutter glasses make each lens go opaque and then transparent again in sync with the images displayed on the screen. When the screen displays the image for the left eye, the right lens will go dark so that only the left eye can see it. Then, when the image for the right eye is displayed, the left lens will darken and the right lens will become clear again. These images flip back and forth faster than the human eye can perceive. It just seems as though you are watching a film through regular glasses, even though in a sense you are watching the movie one eye at a time. This is why shutter glasses are called an “active” 3-D technology. There are several ways to make shutter glasses; the most common format right now is to use LCD technology that can make each lens go dark and clear very quickly. Unfortunately, it takes power to make this transition, which leads to another drawback of shutter glasses: They require batteries. In order to sync the shutter for each eye with the proper image on the screen, shutter glasses usually employ a special infrared emitter placed on top of the TV and pointed at the viewers. The infrared signal tells the glasses when to darken each lens, keeping the glasses in sync with the show so that viewers get the proper 3-D effect. If the infrared emitter is obscured, the glasses won’t work properly. So why are there so many different types of 3-D glasses? Why use anaglyph when polarized has less color distortion? And why have shutter glasses when passive glasses are so much cheaper? It turns out that it all depends on what medium the 3-D content is in. The main reason shutter glasses have been developed is for 3-D TVs. The other two main options, polarized and anaglyph, have major drawbacks. “With current TV systems, it is not possible to show polarized images – they cannot be projected onto a screen as in movie theaters,” Sheedy pointed out. That eliminates the polarized option. And while anaglyph technology works and has been used on TV for decades, the color distortion problem makes it a less desirable alternative. But there is a bigger reason to go with shutter glasses. “[Shutter glasses] allow Sony to provide the very best possible 3-D picture quality – full HD 1080p. Passive or polarized glasses only allow you to receive 720p or half-definition images,” said Greg Belloni, spokesman for Sony Electronics. With high definition being the standard format for TV these days, shutter glasses were the obvious choice. The main problem is that shutter glasses from one brand usually don’t work with a different brand of TV, so they can’t be used just anywhere. And even with the infrared emitters, the glasses can sometimes fall out of sync by milliseconds, which results in an effect called “flicker.” The glasses cause the image to appear to flicker, which ruins the viewing experience and possibly even the 3-D effect. And then there’s no getting around the price. Belloni said that all 3-D glasses for Sony’s BRAVIA line of 3-D TVs will be priced at $150 each. Each TV comes with two pair of glasses, but if more than two people want to watch at once, you’ll have to crack open the wallet for more. All three technologies are usable in movie theaters because the image is projected onto a large screen instead of displayed on a glowing TV screen. However, it should come as no surprise that most theaters are going with polarized glasses. They avoid the color problems of anaglyph glasses and the high price of shutter glasses. The home theater is still a gray area for 3-D glasses. If you use a TV, then the answer is the same as the one explained above. But some owners use a projector or DLP TV in their home theaters. This makes it possible to use the cheaper polarized glasses and forgo the shutter glasses. It’s not so simple though. Polarized 3-D content requires two separate projectors or a projector that can display two images simultaneously. In the end, that might cost more than buying a few extra pairs of shutter glasses. The other problem is getting content. Since most 3-D movies will be encoded for TVs, which use shutter glasses, there may not be as much content available for purchase in polarized formats. It remains to be seen if home projectors will comprise a large enough portion of the market to make a difference or if TVs will just be the standard display format. While most 3-D gaming monitors are quite expensive and require shutter glasses, some manufacturers such as NVIDIA and iZ3D are including an option in their hardware to encode 3-D-capable games in anaglyph. This provides a much cheaper option for gamers, but it only applies to PC gaming. Console gaming – on the Xbox or Playstation 3, for example – which usually relies on a TV for a display, will likely always rely on shutter glasses. Whats the Difference Between Active and Passive 3D TV Glasses? One of the first questions viewers ask when thinking about 3 D TV is “What is the difference between active 3 D glasses and passive 3 D glasses?” After all, it is the glasses that make it possible for the viewer to actually see the 3D image produced by the high-end home theater system. They can also be a major factor in the cost, as every viewer needs a pair of 3D glasses, which can add up, particularly for those with large households. The basic answer is that the active glasses do more to produce the 3D effect for the viewer while passive glasses simply work because of what they are rather than what they do. The most important thing to remember is that the two kinds of glasses work with radically different 3D implementations, and it is very important to make sure the glasses match the technology of the television. In order to choose between 3D glasses, it is important to understand how they work, and it is impossible to fully understand how the glasses work without understanding the basics of 3D. Humans perceive objects in three dimensions because the human brain synthesizes a single image out of two disparate ones. This works because the human vision system is based around the eyes, which are both not in the exact same place on the head, so no object is perceived at exactly the same distance with both eyes, making it easier for the brain to place them in a 3D space. This also makes it possible to judge relative distance between objects. Unfortunately, it is very difficult to reproduce this when viewing images on a screen, as every component of the image is the same distance from the viewer’s eye. Just as the human eye perceives three dimensions due to the differences in perception from one eye to the other, 3D TV and 3D movies, attempt to create the illusion of three dimensions by providing different images to each eye. While the methods may change, every system designed to create 3D images from a two-dimensional display is based around this same principle. This was how the red and blue glasses of the 1950s worked, and it is how both active and passive 3D TVs work. Passive 3D TV works exactly the same way that 3D works in the movies, using polarized lenses to provide different images to each eye. With a passive system, the TV screen is coated so that light from alternate scan lines is polarized differently. The TV then interlaces two images on the screen, one for each eye. Meanwhile, the polarization in the lenses, which matches the coating on the screen, ensures that the proper image is delivered to each eye. It is a simple and elegant system that relies on basic optics. Passive 3D is currently only used on some LCD TV and LED LCD TV models, and it is not available on plasma TVs. Due to the fact that it requires a screen coating, it may never be available for projectors. Active 3D TV uses a much more complex system to achieve the same goals. Rather than interleaving two half-resolution images in space, it interleaves two full resolution images in time. The TV rapidly alternates showing images for the left and right eye, while the glasses use electronic shutters synchronized to the TV to ensure that each eye sees a different image. This system is more complex but allows for a higher resolution 3D image. The only real technological requirement for the TV is that it be able to refresh the screen quickly enough to supply images for both eyes. Another thing to consider is that active 3D is the only form available on projection and plasma TVs, as well as LCD and LED LCD models. Regardless of the technology the viewer prefers, there is probably an active 3D TV available for their needs. One thing that should be noted before comparing active and passive 3D glasses is that the choice of which glasses to buy is as much about choosing which 3D TV implementation as it is about the glasses themselves. The following table provides a handy feature comparison for the two different types of 3D glasses. Weight Heavy, glasses have to contain both the shutter mechanism and battery. Light, thin plastic lenses and frames are the only components required. Image Quality Very good, provides full resolution high-definition image. However, some viewers may notice flickering due to the shutter mechanism, which may also lead to headaches. Lower effective frame rate can also lead to jerkiness in the image during fast pans and other movement. Average, provides half-resolution high-definition image. This means that depending on where the viewer is sitting, they may see either black lines on the screen like some old video games, or noticeable jaggedness. This can be minimized either through the use of a smaller screen or by sitting farther away from the screen. Price High, active glasses are complex electronic devices with wireless communication abilities. May be cost prohibitive if many pairs are needed for a big family. Low, passive glasses have no moving parts or electronics. Ease of Use Average, active glasses require connection and synchronization before use. Easy, passive glasses only require wearing. No need for connection or synchronization. Compatibility Low, the majority of glasses only work with TVs from the same manufacturer. There is a plan for a universal active 3D glasses standard but not all TVs may follow it. High, passive 3D glasses use the same system found in movie theaters. It is a common standard, and all modern passive 3D glasses are compatible with all TV sets that use the system. Availability High, active 3D can be used with any TV technology, including both projection and plasma as well as LCD. Average, passive 3D only works with LCD-based TVs. It specifically does not work with projection or plasma TVs. Brightness Average, the shutter mechanism in active 3D glasses causes a measurable reduction in light transmission, producing a dimmer image. This is particularly noticeable when watching in brightly lit conditions. Good, the polarizing filters in passive 3D glasses have a minimal effect on the transmission of light. While they do cut out some light, images do appear brighter than when using an active 3D system. Both active and passive 3D glasses have advantages and disadvantages in both casual and regular use. Passive glasses require less set up but work with fewer technologies, while active glasses provide a crisper image at the cost of brightness and possible flickering. The biggest difference between active and passive 3D glasses is that active glasses use power and passive ones do not. Each technology has its advantages and disadvantages, and neither is a perfect solution for all users. Passive 3D glasses are lighter weight and more suitable for extended viewing; they are also easier to use: simply put them on and start watching. Active 3D glasses provide a higher quality image without the jagged lines associated with passive 3D glasses. They also require synchronization with the TV and sufficient power for the entire viewing session. Passive 3D glasses require that the TV have a special coating on the screen that is only available on LCD and LED LCD TVs, while active 3D glasses can work with both projection and plasma TVs as well as the LCD variants. Consumers wishing the absolute highest quality 3D image and those who wish to use a TV other than an LCD-based 3D TV should choose a solution using active 3D glasses. Those looking for a solution that is less expensive and easier to implement may be better off with passive 3D glasses. How to Diffuse Essential Oils with a Humidifier? Essential oils are highly concentrated extracts from plants and are used in a variety of ways to improve the smell of your house, office or room. They are also used to improve moods and sooth minds. You can use essential oils in your bath, in lotions or beauty products, household cleaning and even bug repellents. One popular way to diffuse the smell of essential oils is to put the oil in a humidifier. The humidifier then spreads the scent of your essential oil throughout the entire room. 1. Open the water chamber of your humidifier. This is the area where you pour the water into the humidifier. 3. Turn the humidifier on and let it run through the night. If you want to use the humidifier during the day, add three to nine more drops of essential oil as the scent wears off. 1.As an alternative to the humidifier method, add several drops of essential water to boiling or very hot water. Let the water set and the steam will diffuse the scent of your essential oil through the air. 2.Clean the humidifier after each use with the essential oil. It’s possible that the essential oil may damage the plastic parts of your humidifier. This is not common but is still a risk to consider. Most essential oils are high in antibacterial, antifungal, and antiviral properties: This makes them an excellent addition to your homemade cleaning preparations. Oils that are best for cleaning are: Lemon, grapefruit, eucalyptus, peppermint, tea tree, lavender, and rosemary. Essential oils are miniscule in molecular size, which means they are absorbed well by the skin – making them perfect ingredients in personal care items intended to heal, soften, and nourish. However, they do not accumulate in the body over time – they simply offer up their healing properties and then pass on through. Scientific studies have shown that rosemary essential oil helps your brain perform. Specifically, smelling rosemary essential oil helps memory recall and performance on tests. Interestingly, this study also showed that groups that inhaled either rosemary or lavender essential oil felt much more relaxed than those who inhaled no odor at all. Enormous amounts of plants are needed to produce essential oil. In fact, on the extreme end, it takes 4000 pounds of Bulgarian roses to produce 1 pound of essential oil. Other plants like lavender only take 100 pounds of plant material to produce a pound of essential oil. Still, can you imagine how concentrated essential oils must be, in light of how many plants are used to produce them? Most essential oils should never be used undiluted on the skin. Instead, they should be combined with “real” oils (called carrier oils), waxes, butters, alcohols, or other diluting measures. Because they’re so concentrated, if you don’t dilute, you may end up with an unfortunate reaction (and unhappy skin). There are a few essential oils that are generally recognized as safe to use undiluted. Of course, there has to be a few exceptions to the rule. Again, in Organic Body Care Recipes, the author points out that the only essential oils that are widely acknowledged as safe to use undiluted (sparingly) are: lavender, German chamomile, tea tree, sandalwood, and rose geranium. Avoid the following essential oils while pregnant or nursing (and skip EOs completely in your first trimester): Aniseed, cedarwood, chamomile, cinnamon, clary sage, clove, ginger, jasmine, lemon, nutmeg, rosemary, sage (this is only a partial list of some of the more common essential oils – view the full one here). To test if you’re sensitive to an essential oil (which is probably best to do before using it in a skincare preparation): Combine one drop of essential oil with 1/2 tsp carrier oil (like olive, jojoba, or sweet almond). Rub this on the inside, upper portion of your arm and wait a few hours. If no redness or itching develops, you’re most likely not sensitive to that essential oil. Keep all essential oils out of the reach of children – and avoid contact with your eyes. This is just standard safety precautions, but must be mentioned. Do not take essential oils internally, especially oils like wintergreen and eucalyptus. While some essential oils may be used well-diluted in something like toothpaste with safety, it’s generally recognized that there’s no need to take essential oils internally. In fact, there are several toxic essential oils that should be avoided even through skin contact. Luckily, these are NOT common essential oils, and most of them you’ll never find in the store. Not all essential oils are created equally, nor does more expensive necessarily mean “better.” There are certain brands I will use in a less therapeutic fashion (like for cleaning), because they’re far less expensive than their counterparts. When you see a wide fluctuation in price between, say, lavender essential oils, you can bet that the far less expensive one is likely lower in quality. However, a small variation in price differences on the higher end will NOT mean a better essential oil. It will just mean a higher price. (A little birdie also told me that there are also only a handful of essential oil distilleries in the world, which means that most essential oils come from the exact same places – thus there is little difference in quality between the more “typically priced” EOs.) What I’m saying here is: Understand that you DO have to pay for quality, but that if you’re just using essential oils in non-therapeutic fashions, it’s okay to use less expensive oils (like the Beeyoutiful ones pictured at the top of this post, or NOW brand essential oils). But if you want high quality, I suggest using Mountain Rose Herbs or another ethical supplier that offers organic essential oils (grown without pesticides or toxic fertilizers). To test your essential oil to see how “pure” it is, put a single drop of it on a piece of construction paper. If it evaporates quickly and leaves no noticeable ring, it is pure. If you have a ring left, then it is likely diluted by the manufacturer with an oil of some sort (this test will not work for myrrh, patchouli, and absolutes). Essential oils will last for at least 5 years (if not 10), so one bottle could literally last you a decade. Hopefully that thought will help mitigate the cost involved in purchasing some essential oils. Because they are SO concentrated and only a tiny amount is needed in anything you do, they’ll last you a very, very long time. The only exception to this rule is citrus oils, which will see a reduction in potency after a year or two. Store your essential oils in dark glass bottles (which they were probably packaged in) and out of direct sunlight. This is simply to help preserve their potency. Remember that what you’re allergic to in food, you will be allergic to in essential oils. So if, for some reason, you can’t eat sage without breaking out in a rash, steer clear of sage essential oil (or any product containing it). The recommended usage of many essential oils is hotly contested throughout the aromatherapy profession. 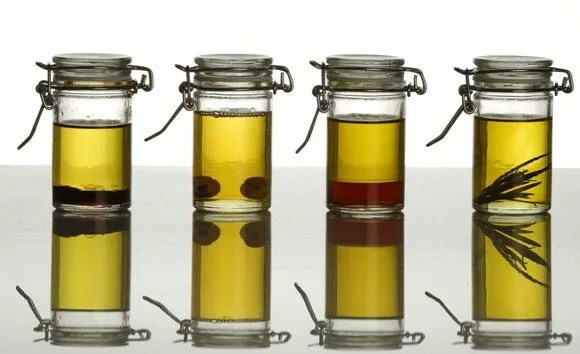 The majority of oils you find in the supermarket are absolutely safe (though you should research them before using them); however, once you start digging into the world of essential oils, you’ll find that professionals – even within the same organization – debate extensively over the use of certain oils. If you’re ever unsure about an oil or its use, do the research you can, and if you still cannot make up your mind as to its safety – avoid it. But, by all means, do NOT be afraid of essential oils. Just use them with care and respect, and all will be fine. “What essential oils do you recommend I buy?” is the number one question I receive. It’s a tough one to answer, because what EOs you buy depends on what you’re going to use them for. Nonetheless, I’ve narrowed it down to 7 essential oils to consider when starting to use them in your personal care products or homemade cleaning supplies. All of these essential oils also happen to be some of the least expensive and easiest to find. Bonus! Where should you buy them?